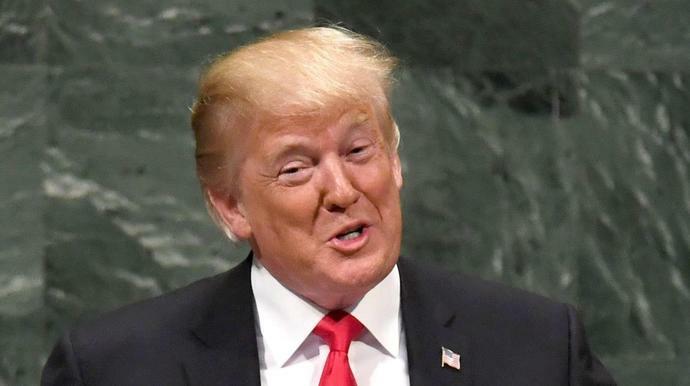 President Donald Trump claimed his administration is one of the most accomplished in U.S. history during a speech Tuesday at the United Nations General Assembly ― and the audience's reaction caught him off guard. ″In less than two years, my administration has accomplished more than almost any administration in the history of our country ... So true," the president said, eliciting several muffled laughs. "Didn't expect that reaction but that's OK," Trump responded with a chuckle, prompting the audience of world leaders, their aides and the media to erupt with laughter. The awkward moment comes just months after Trump said during a cabinet meeting in June that the "whole world is laughing at the United States"― and some Twitter users were quick to make the connection. After his not-so-humblebrag, Trump's speech pivoted to world issues. He bashed socialism and addressed violence in Syria, the Iran nuclear deal and additional sanctions on Venezuela.